Toughen up your '06-'10 Dodge Charger and give it that distinct "muscle car" look with our one (1) piece Decklid Black-Out Graphic Kit. Comparable to the Dodge Charger Daytona R/T's rear decklid, graphic is precut and ready to install in a wide variety of colors - NO TRIMMING required. 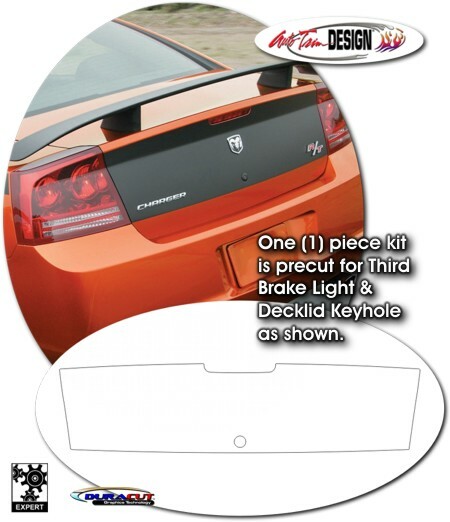 Graphic kit consists of a prefitted and contoured piece as shown in the image and specifically fits any '06-'10 Dodge Charger factory rear lid. It will not fit any other vehicle. Please Note: This graphic is somewhat difficult to install. While most experienced installers will not have any problems with the application of this graphic, it'll be a challenge for the novice. Moreover, installation of this kit requires removal of existing factory emblems. Once graphic has been successfully applied, emblems can be carefully re-installed onto graphic surface, if desired. Lastly, our graphic is fit close to each side of the rear decklid with an approximate 0.0625" (1.5875mm) to 0.125" (3.175mm) margin. It DOES NOT wrap around the edges like the factory Dodge Charger Daytona R/T's rear decklid.